As a class, we have just formally proven the Triangle-Angle-Sum-Theorem. (An informal illustration of this theorem can be seen here.) Because we know what we now know, we should be able to make some other conclusions that are an immediate consequence of this theorem. Such a conclusion is referred to as a corollary. A corollary is a statement (another theorem, really) that can automatically be proven true as a result of a "bigger-picture-theorem". 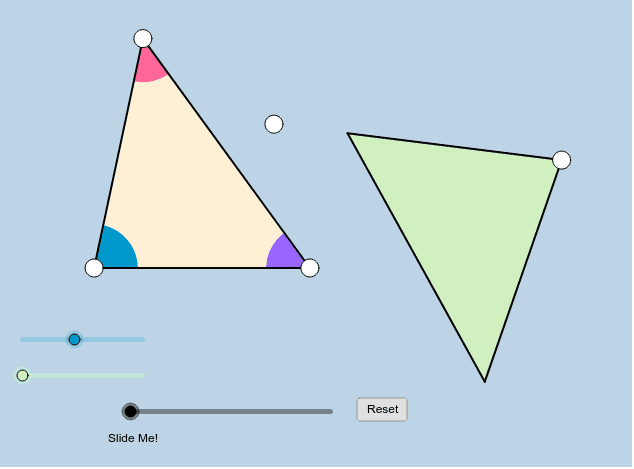 One corollary that is easy to prove as a result of the Triangle-Angle-Sum-Theorem will be illustrated below (once you slide the slider). Interact with this applet for a few minutes, then answer the questions that follow. As you do, feel free to move the white points anywhere you'd like. Write the phenomena you've just observed above as a conditional ("if-then") statement. This corollary (you wrote for (1)) can be easily proven using the Triangle-Angle-Sum-Theorem. Briefly explain how this can be done.